Approximately 200 current and former Flight Centre staff have contacted the ABC with complaints about their experience at the travel giant, after an ABC investigation unearthed staff claims of customer rip-offs and a toxic culture. Among the litany of fresh complaints, former staff described bullying, pressure to consume alcohol, instances of drug use within stores, secret marking-up and a cult-like atmosphere. “I was bullied, my integrity compromised, my self-worth destroyed and my mental health left in tatters”, “it was 100 per cent a cult” and “it’s like Lord Of The Flies at times” — were among the claims made to the ABC. Others said they suffered severe mental health issues as a result of their employment at the organisation, while one woman said she was bullied at work in the last week of her pregnancy. A former staff member who worked both in frontline and back office roles over seven years said “there is a culture of ‘what happens at Flight Centre stays at Flight Centre'”. “There were situations where I saw area leaders sleeping with staff members and rampant drug use,” the former worker, who requested not to be named, told the ABC. “There were certain stores in locations in a couple of our major cities where drugs were constantly on the premises. There was a drug drawer in one of the stores, where consultants were encouraged to do cocaine on site. The fresh claims come after Flight Centre staff told the ABC the $6.7 billion company is built on a “work hard, play hard” culture, including all-but mandatory booze-soaked “buzz nights”, which are known to devolve into sexually-charged hard-drinking sessions. Other staff members detailed humiliation, harassment and sexually explicit conduct directed towards female employees at company events. The male staff member the ABC spoke to said his Flight Centre colleagues had complained about instances of sexual harassment, but believed they were not taken seriously, as the behaviour was mirrored by male team leaders and those responsible for managing complaints. Another former staff member told the ABC she was bullied once she became pregnant, after several years of being a high sales performer, manager and trainer. Flight Centre told the ABC, “bullying is not tolerated in any shape or form and people should not be pressured in any way”. “Flight Centre employs about 20,000 people globally and about 10,000 people in Australia. We are surprised and concerned that some past and present employees have chosen to contact you,” a spokesperson told the ABC. On Wednesday, Flight Centre boss and founder Graham ‘Skroo’ Turner encouraged staff to post their “feelings on the ABC Facebook page”, prompting dozens of current staff members to express their support for the company. The ABC has revealed widespread staff complaints about low pay — the Flight Centre travel consultant base retainer is below minimum and award wage — and the push to increase mark-ups on fares, accommodation and other travel bookings, in order to increase their own and the company’s commissions. Staff claimed those mark-ups were in the hundreds and even thousands of dollars. Almost a third of staff who contacted the ABC following our earlier report said they were encouraged to build in mark-ups to customers’ bookings. Some claimed they learnt methods to conceal mark-ups from customers, while others said older or wealthier customers were targeted. Flight Centre told the ABC, “we are a retailer and we do earn a margin on the products we sell. Our overall margins are available publicly, but are not generally disclosed on a transaction-by-transaction basis”. 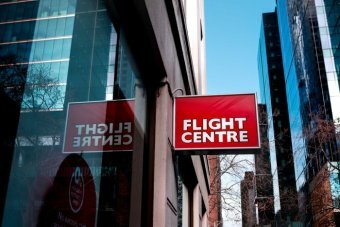 Linda White of the Australian Services Union, which covers 6,000 of the sales staff at Flight Centre, most of whom are not members, said reports of bullying and harassment were concerning. “We are very and deeply concerned about the welfare of staff, given those claims that have been made about what has happened at some events,” Ms White told the ABC. Flight Centre’s share price fell 2 per cent yesterday. The company is due to announce its full-year financial results later today. Previous articleWho can protect Rohingya returnees?